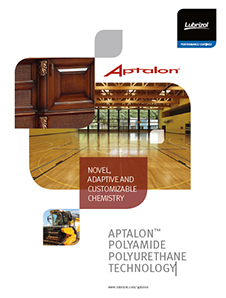 Aptalon™ M8100 by Lubrizol is a waterborne self-crosslinking 1K polyurethane dispersion designed using patented polyamide polyol technology. It offers durability for accelerated weathering performance, excellent hydrolysis-, corrosion-, chemical resistance, hardness that outperforms typical waterborne polyurethane chemistries. It is NMP-, NEP- and APEO-free. It is recommended for use in paint & coating topcoats for medium duty, metal substrates, interior/exterior applications, ISO category C1-C4 end use metal applications such as OEM factory and field applied, excellent waterborne topcoats in ACE, building construction and transportation component markets. 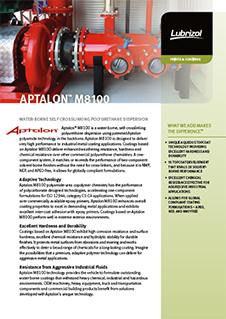 Coatings based on Aptalon™ M8100 perform well in extreme exterior environments. It has a shelf life of one year.